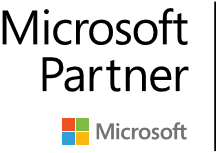 Analytics on Project Server is to monitor the progress of your projects and to identify and mitigate major Risks and Issues to achieve timeliness and defect-free delivery. Insights on major factors affecting project health so you can take necessary actions to get back to speed. When you talk about managing projects in your organisation, the first thing you need to understand is how your projects in different phases or sprints are progressing over time and a way to easily identify which ones among them needs immediate management attention because (a) They are severely lagging behind their schedule; (b) they are under-resourced or their might be other issues involved. 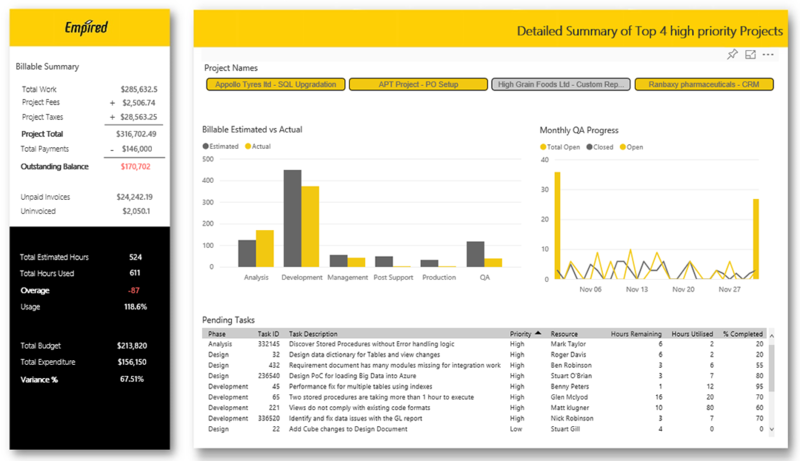 The answer to this is a Gantt report in Power BI that gives you clear insights on Project timelines and current status. With this Dashboard you can easily identify Current phase of the project and resource utilisation. Not just that, it gives you summary of Total open, closed projects and the ones that are behind schedule. What are your key projects and their overall health? 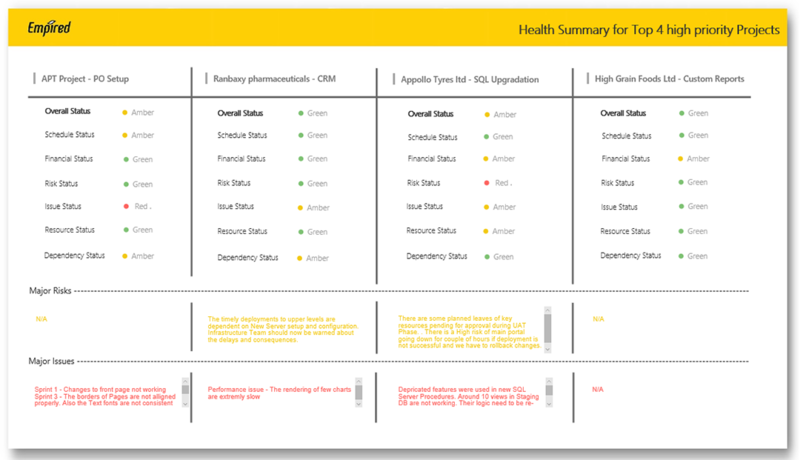 What is the Status of different KPIs like Finance, Schedule, Resource etc.? What are the major Risks and Issues that could slow down the progress or can become a roadblock down the line? This help you identify and mitigate major risks and issues to ensure smooth progress of projects. Being a project manager you are also responsible to track the billing and hours consumed vs budgeted for the project. In addition, you would need to prioritize the tasks and monitor how the work is being progressed. 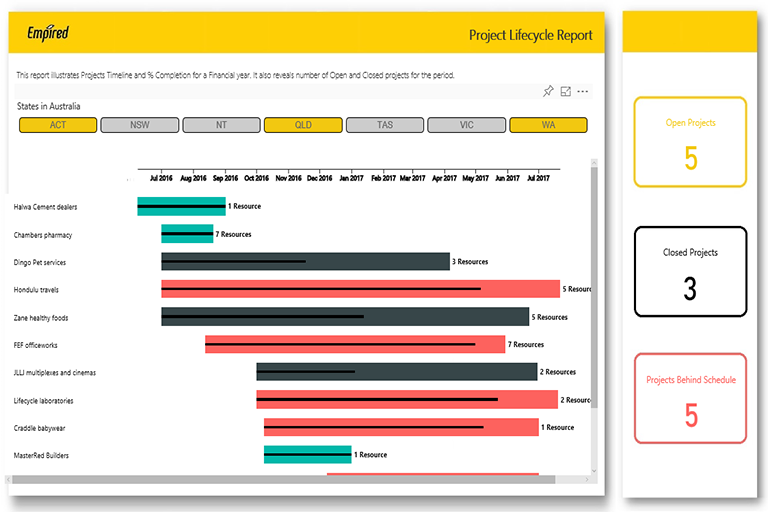 This page gives you detailed summary of project T and M. You can now easily track your planned hours vs actual spent across different phases of Project lifecycle. It also highlights outstanding balance and unpaid invoices to help you remind your clients for the payments. On the same page, you can also monitor your month on month QA register on Open Vs Closed issues. You can then drill into detailed view to track open tasks, their assignments and what is pending.